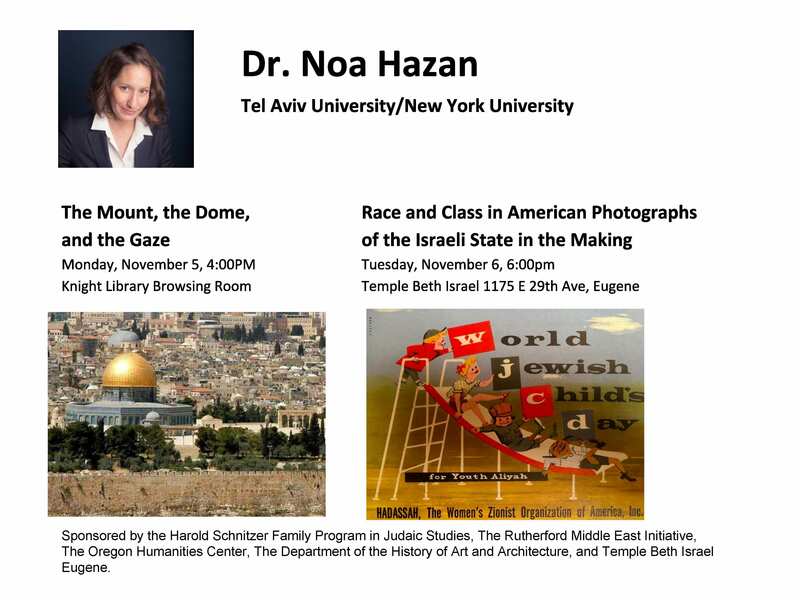 The Harold Schnitzer Family Program in Judaic Studies is delighted to announce that Dr. Pamela S. Nadell, Patrick Clendenen Chair in Women’s and Gender History in the Department of History at American University will be speaking at the University of Oregon on Tuesday evening, April 16, at 7:30 PM, in the Knight Library Browsing Room. The talk is free and open to the public. 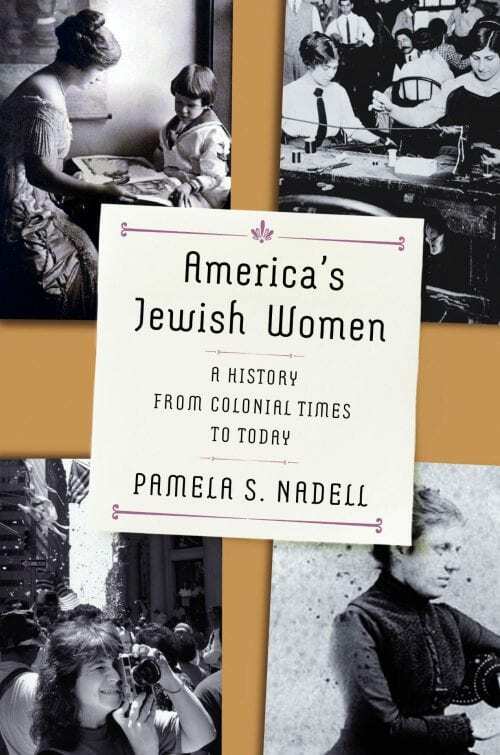 Professor Nadell will be addressing her major new book, AMERICA’S JEWISH WOMEN: A History from Colonial Times to Today. The book was reviewed in the New York Times Sunday Book Review on March 29, 2019 New York Times. Professor Nadell, who served as president of the Association for Jewish Studies between 2015-17, also chairs American University’s Critical Race, Gender, and Culture Studies Collaborative and is Director of the Jewish Studies Program. Her 1998 study, Women Who Would Be Rabbis: A History of Women’s Ordination, 1889-1985, was a National Jewish Book Award Finalist. 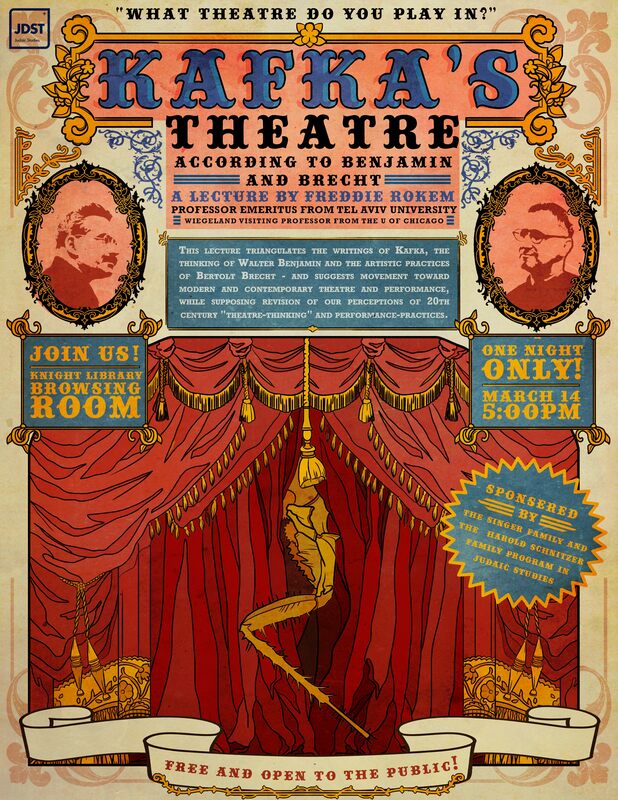 Sponsored by the Singer Family and the Harold Schnitzer Family Program in Judaic Studies. 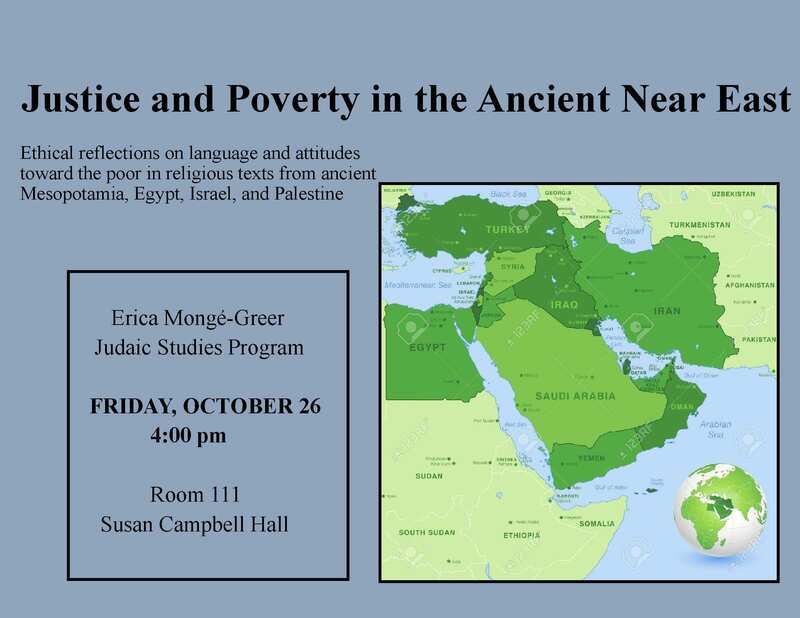 Ethical reflections on language and attitudes toward the poor in religious texts from ancient Mesopotamia, Egypt, Israel, and Palestine with particular focus on the Book of Psalms. Placing a mezuzah on the doorpost is among the most ancient of Jewish traditions. Elaine and Norman Winik collected mezuzahs throughout their numerous visits to Israle and other Jewish communities. Their collection, bequeathed to OJMCHE in 2017, reflects a wide range of styles and materials and is on public exhibition for the first time. Galit Hasan-Rokem, Max and Margarethe Grunwald Professor of Folklore and Professor of Hebrew Literature (emerita) at The Hebrew University of Jerusalem. 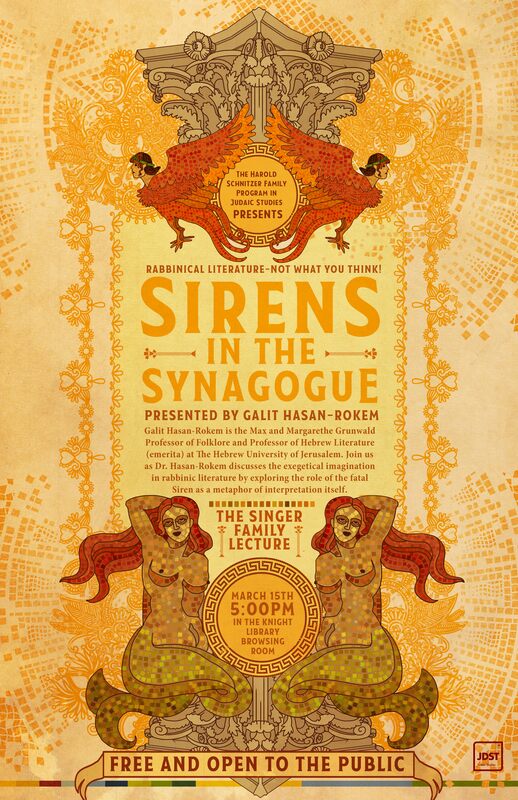 Join us as Dr. Hasan-Rokem discusses the exegetical imagination in rabbinic literature by exploring the role of the fatal Siren as a metaphor of interpretation itself. This event is sponsored by the Singer Family and the Harold Schnitzer Family Program in Judaic Studies. A passage in Babylonian Talmud Gittin 57a discusses a scientific test the Rabbis used to clear a woman falsely accused of adultery. This talk reveals the larger context of that accusation and explores references to this forensic technique in medieval Jewish and Muslim sources. CORVALLIS, Ore. – Lucille Eichengreen, a Holocaust survivor who endured the Lodz Ghetto and the concentration camps at Auschwitz and Bergen-Belsen, will speak at Oregon State University April 25 as part of the university’s annual Holocaust Memorial Week. Eichengreen was born as Cecilia Landau in Hamburg, Germany, in 1925. Her father and sister were murdered in the concentration camps and her mother died of starvation in Lodz. After liberation, Lucille assisted the British in identifying and bringing to justice more than 40 people who had oppressed prisoners in the Nazi camps. Her work drew death threats and she later moved to the U.S.
Eichengreen has spoken widely of what she saw and experienced during the war and has been much honored for this educational work, particularly in Germany. Her memoir, “From Ashes to Life,” tells her story in detail. The talk begins at 7:30 p.m. in the Austin Auditorium at the The LaSells Stewart Center, 875 S.W. 26th St., Corvallis. The event is free and open to the public but attendees are encouraged to obtain free tickets in advance to ensure a seat. Tickets are available online at: http://bit.ly/2nYJLoz. A book-signing will follow. 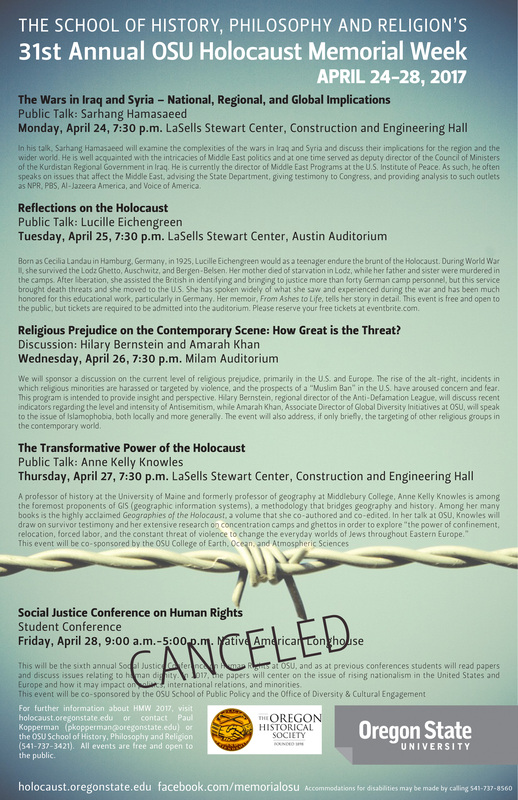 Holocaust Memorial Week is presented by the School of History, Philosophy and Religion in OSU’s College of Liberal Arts. All events are free and open to the public. The program will include a theme of genocide and a focus on human rights. 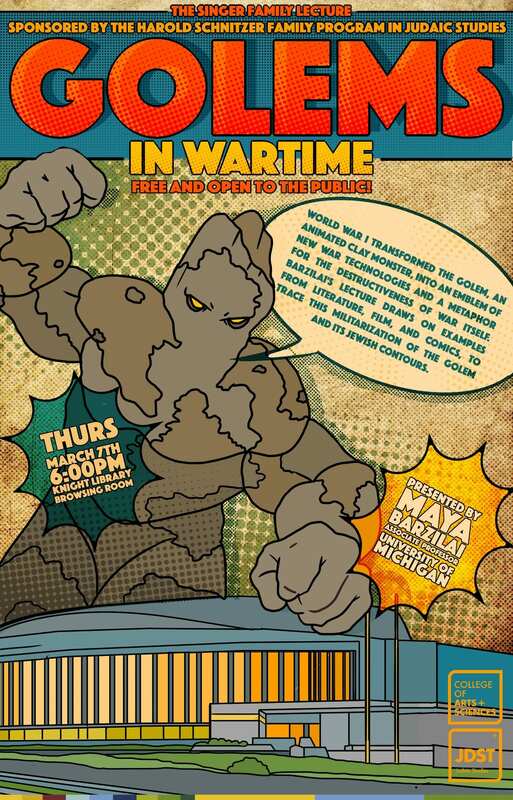 Monday, April 24: A public talk Sarhang Hamasaeed, “The Wars in Iraq and Syria – National, Regional and Global Implications,” 7:30 p.m. in the Construction and Engineering Hall at The LaSells Stewart Center. Hamasaeed, director of Middle East Programs at the U.S. Institute of Peace, will examine the complexities of the wars in Iraq and Syria and discuss their implications for the region and the wider world. Wednesday, April 26: Discussion, “Religious Prejudice on the Contemporary Scene: How Great is the Threat?,” at 7:30 p.m. in the Milam Auditorium. Hilary Bernstein, regional director of the Anti-Defamation League, will discuss recent indicators regarding the level and intensity of anti-semitism, while Amarah Khan, associate director of global diversity initiatives at OSU, will speak to the issue of Islamophobia, both locally and more generally. Weather permitting, a candlelight vigil affirming religious and cultural understanding will follow in the MU Quad from 9:15 p.m. to 10 p.m.
Thursday, April 27: A public talk by Anne Kelly Knowles, “The Transformative Power of the Holocaust,” at 7:30 p.m. in the Construction and Engineering Hall at The LaSells Stewart Center. Knowles, a professor of history at the University of Maine, is among the foremost proponents of geographic information systems, a methodology that bridges geography and history. In her talk at OSU, Knowles will draw on survivor testimony and her extensive research on concentration camps and ghettos in order to explore “the power of confinement, relocation, forced labor, and the constant threat of violence to change the everyday worlds of Jews throughout Eastern Europe.” The talk is co-sponsored by the OSU College of Earth, Ocean, and Atmospheric Sciences.